Such a sleek device deserves the best protection, so create your own personalised iPad Air case to combine safety with style. Hand-stitched in London using thick, padded Neoprene fabric, the front & back of your tablet is safeguarded from the elements. Design both sides using your photos, artwork or text. When you pay so much for an iPad, it only makes sense to give it the ultimate protection. The Neoprene fabric provides a cushion for your device, protecting both the screen and the reverse from dust, scratches and the elements. Ideal for when you're on the go and general storage. Also, it can be used as a personalised iPad Air 1 case or a personalised iPad Air 2 case, as they're both the same height and width. Brilliant service. Quick response to my queries. Fast efficient service. Good quality product that arrived early. Would definitely use again. Considering I sent an I-pad picture of a picture the quality of the I-pad cover was excellent ! The delivery although expensive means that I can use your service directly rather than have to enlist a friend to post on any item I order. Thank you and I will not hesitate to tell friends. Like many of our products, the photo iPad Air case comes with a quantity discount, so buy more than one today and save money. Your custom iPad Air case is completely handmade to order in London, UK, by our team of expert seamstresses. We print your photos onto our unique neoprene, cut to size and hand stitch together featuring a border trim in your colour of choice. The specialist printing process binds the ink to the fabric creating a long-lasting print that won't scratch off or peel away. We stitch the front and back of the fabric cover together using a binding trim, so approximately 1 cm on each side is needed for this. When designing, keep important features away from the edges to guarantee they won't be lost in the hem. Your design can be either landscape or portrait, so double check your photos in the preview to make sure they're the orientation you want. Use some of our fun image tools to create a bespoke message on your customised cover. Choose the 'Keep Calm' font and write a tongue-in-cheek quote such as 'Keep Calm & Carry On Pretending to Work'. As a gift to your colleague or boss, this is sure to get everyone in the office giggling. 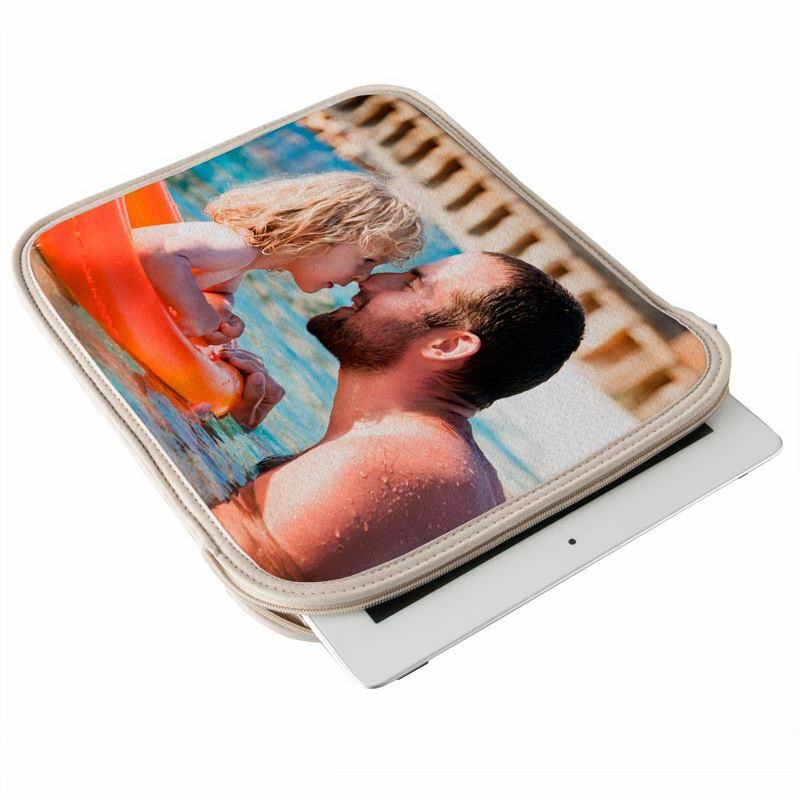 An iPad Air case personalised with a bold photo collage is a unique way to make an impact, as well as being easily identifiable. Upload snaps from your favourite holiday for a contemporary look, or choose old family photos and turn your protective sleeve into a vintage keepsake. Select the 'create montage' option and choose from ready-made collage patterns or have fun designing your own. Because you've got both sides to design, you can use one side for a photo, and the other for a message. This is ideal for companies; print your logo/branding on the front and the name of the employee or business information on the back. This subtle promotion might go a long way. Personalised leather iPad cases you design. Create custom printed leather iPad cases in our design system.